Rancho La Villita is the site of three Extreme Trail clinics in 2015 with three time National Extreme Trail grand champion Mark Bolender. Riders of all levels, and horses of all breeds, are welcome on May 11–13 and 15–17. An all-breed clinic for advanced riders takes place Sept. 5–7. Each offers an opportunity to learn new ways of being with your horse, and to improve your riding in the show ring or on the trail. Space in each clinic is limited to 12 participants. For information or to register, contact Barbara Windom at Barbara@LEAPeruvianhorses.com; or visit laestanciaalegre.com. A flamboyantly painted wall extends along an old dirt road in Alcalde, 34 miles north of Santa Fe. Its brilliant hues blend classic cartoon characters such as Wile E. Coyote with stylized, taglike calligraphic designs until an old metal archway marks another road west. rancho la villita, announces the iron sign, which has straddled the path since long before the local muralists were born. The area’s unique juxtaposition of old and new entices the visitor to continue down the road, through the cottonwoods, toward the river. Surely, other surprises must lie ahead. The setting is the point of entry to an epic horse story that moves from the loamy landscapes of Peru to the legend of Tinseltown to the lure of northern New Mexico. Here Barbara Windom, the horse-loving granddaughter of Hollywood movie mogul Louis B. Mayer, planted new roots with her poet-and-publisher partner, Victor di Suvero, and an award-winning stable of rare Peruvian Paso horses. In 1994, the former California couple bought the historic Rancho La Villita, a lush 105-acre spread on the west banks of the Río Grande, exactly halfway between Taos and Santa Fe. Here they launched La Estancia Alegre—the Happy Ranch. But Windom’s Paso passion is neither hobby nor horseplay. 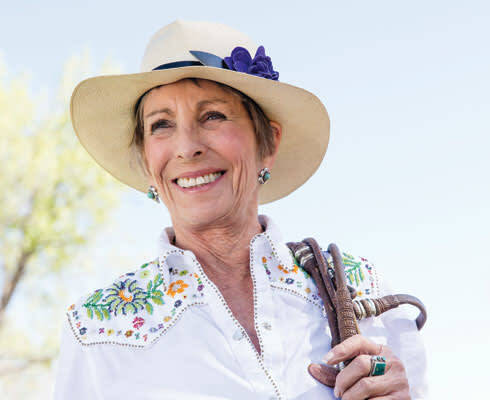 As breeder and booster, she has both helped the once endangered equine to survive and put La Estancia Alegre on the map as one of the premier Paso breeding and training operations in the United States. In July, La Estancia Alegre and Windom received the prestigious High Point Breeder and High Point Owner awards at the Denver Queen City Horse Show, the regional Peruvian Paso championship. Windom’s Pasos are some of the winningest in the West. New Mexico’s rich Spanish history and horse culture make it a natural place for nurturing the Paso breed, which descends from Spanish bloodstock. Indeed, 16th-century Spanish soldiers may have steered their Spanish Barbs—one of the Paso’s ancestors—and other prized steeds across Rancho La Villita lands as they explored the Alcalde area before establishing New Mexico’s first capital at nearby San Gabriel. As Spanish villages and ranches took root, other adventurers came to live in the rural neighborhood. By 1740, part of Rancho La Villita was the site of a bustling stagecoach stop. In 1923, East Coast heiress Mary Cabot Wheelwright bought nearby Los Luceros, another historic 18th-century ranch. She lived there until her death, in 1958, during which time she founded Santa Fe’s Wheelwright Museum of the American Indian and contributed to other cultural causes. For their part, the road to Rancho La Villita led Windom and di Suvero to a rare opportunity to preserve the equine history of Peru in the equine cradle of the West. As their New Mexico story unfolded, the enterprising equestrian and her poet partner would, in vision and voice, come to personify the adventurous spirit of New Mexico. "I never planned on doing a big breeding program," Windom says. "I just wanted a horse." In a cozy back room at Casa Girasol (Sunflower House), Windom and di Suvero’s colorful, rambling ranch home, a black- and-white photo captures a one-year-old Barbara on a wooden rocking horse. Next to it is one of Windom at age three, astride a real horse. Nearby, a teenaged Windom virtually flies across the frame as she clears a hurdle on horseback. Windom was two when her legendary grandfather took her on her first pony ride. Her father, producer and studio executive William Goetz, owned a small stable of thoroughbreds. Encouraging horse lessons was his way to distract her from the Hollywood glare. Indeed, Windom was more interested in mares than in Marilyn Monroe, and she showed and jumped horses into her college years. But when she eloped to Reno, dreams of life in the horse ring quickly gave way to the realities of life as a wife and mother of two daughters. A divorce followed, as did a 25-year career in interior design and the antiques business. After moving “one too many dining room tables across a room,” Windom’s bad back made riding horses next to impossible. As Windom sat in her Malibu kitchen one day in the late 1980s, however, she discovered a fascinating article in the Los Angeles Times. The main character was “el caballo peruano de paso,” a medium-sized horse with deep and storied footprints in Peru. Its unique history and choice traits enthralled her. The Paso was introduced to Peru by 16th-century Spanish explorer Francisco Pizarro, whose soldiers depended on the horses’ fortitude in their brutal defeat of the Inca Empire. A select fusion of old-world breeds—the Spanish Barb, Andalusian, and Jennet— the Paso represents the best of each. From the Barb comes energy, strength, stamina. The Andalusian brings elegant beauty, physicality, and poise. The Jennet’s steady temperament and smooth gait are trademarks of the Paso breed. The Paso proved ideal for negotiating Peru’s long distances and rugged terrain, particularly for plantation owners who welcomed a comfortable ride while overseeing vast ranch operations on horseback. Gaited horses were the norm at the time of the conquest, but by the end of the 17th century, most of the world had embraced trotting breeds. By then, Peruvians had developed deep pride in the Paso. The country’s geographical isolation allowed for centuries of selective breeding without introducing new bloodlines. This preserved the Paso’s distinctive character as a gentle, compliant horse that is easily trained and willing to please. It also maintained the horse’s signature four-beat lateral gait, which, unlike the cross-gaited footfall of trotting breeds, enables the Paso’s smooth and easy amble. Such precise genetic alchemy ensured the gait would be passed down to all Paso offspring. With a lustrous, flowing tail and mane that, according to Peruvian tradition, are kept naturally unshorn, the Paso is an aesthetic beauty. The elegant, forward-flowing motion of the horse’s forelegs, known as termino, resembles the outward arc of a swimmer’s arms in a classic crawl. A natural performer, the Paso “swims” and flexes as if fully aware and appreciative of being observed. Perhaps more than anything, it is a mysterious inner quality— called brio—that elevates the Paso to equine royalty. Brio best expresses the Paso’s joie de vivre—its unerring enthusiasm for a life lived loyally in the service of its rider. The Paso thrived in Peru until the 1960s, when government- led reforms shifted private lands to public domain, curtailing breeding operations and drastically reducing the Paso population. Rather than handing over their horses to the government, many breeders slaughtered them. At the same time in the United States, equestrians and breeders were taking an interest in the breed. Among them was Verne Albright, who in 1966 steered two Pasos 7,000 miles from South America to the United States in an effort to introduce the horse to North Americans. As Albright and others began importing small numbers of Pasos, many landed on ranches in California. For Windom, the Times story cracked open another window on a new life that was beginning to take shape with di Suvero, who lived in San Francisco. The two were looking to be together in a place beyond the personal ghosts of their home state. A Thanksgiving trip to Santa Fe convinced them to trade California glitz for New Mexico grit. In 1989, the couple arrived in Tesuque, where they built their first house; where di Suvero created Pennywhistle Press, his small publishing company; and where Windom met her first Paso. At the time, Windom’s intention was simple: to buy a couple of gentle Peruvians to ride on local trails. As soon as she experienced the luxury of the Paso’s easy-in-the-saddle and gentle-on-her-back gait, she was sold on the breed. By the early 1990s, she had acquired four Pasos and built a corral, a barn, and a small arena. But four was more horses than local zoning permitted, and the couple did not have enough land to expand. She and di Suvero decided to sell the Tesuque home and buy in Alcalde, where the historic Rancho La Villita offered expansive, grassy pastures with plenty of room for horses to graze, play, and roam. Just as they began transforming the ranch into a happy home, Windom met the horse trainer who would help turn her once Amodest ambitions into a full-fledged breeding career. Around 1994, Windom traveled to Peru to purchase three Paso mares to add to her small Alcalde stable. Upon her return, she sought a stallion to breed with one of her imports. Her search led her back to Malibu and Roberto Quijandria, a Peruvian-born trainer who had lived in California since 1982. Quijandria grew up four hours south of Lima in Ica, a coastal area stretching into mountains of sand. He began working on a horse farm as a teen, grooming, feeding, and saddling Pasos and other breeds. When the resident horse trainer quit, the owner asked 18-year-old Quijandria to take the job. “He told me I had good hands for the horses, very soft,” Quijandria recalls. By the time Windom brought her mare to Quijandria, he was known on breeding circuits and in the show ring. Having already let one Peruvian trainer go, she took a chance on inviting Quijandria to the ranch. It was mid-October, snowy and cold. “At first, I thought, ‘Maybe I better go back to California,’” he recalls. “But then I looked at the ranch, the house, the Pasos, with the river and the acequia and the sandy hills. I said, ‘I am in Ica.’” Quijandria arrived at the ranch with his wife and baby son in 1996. By then, Rancho La Villita was taking shape. The ranch filled out with more stalls, followed by housing for Quijandria’s family and the ranch foreman. Finally, in 2001, came Casa Girasol, built at the center of a large field, Windom explains, “so that we can see the horses from all the windows.” An avid collector, she filled the house with an extensive collection of international art and antiques, while di Suvero continued to fill books with poetry and prose—both his own and that of other New Mexican writers. Amid the years of ranch construction, Windom and Quijandria nurtured the La Estancia Alegre tradition of champion Pasos. Today, more than a decade’s worth of winning horse show ribbons fall in colorful streams from the ceiling of Rancho La Villita’s sala, a testament that Quijandria has done his job well. Portraits of Poema and all the happy horses who earned the awards line the walls. Reina del Río, Conquistador, Guadalupe, Quivira, and more: Their names evoke the unique merging of their Peruvian history with their New Mexico home. “Sometimes, I choose the names of New Mexico towns,” Windom says. “One year, I named all the babies for Pueblos— Acoma, Isleta, Taos, and so on.” Poema represents the poetry of Rancho La Villita and the Paso breed. Make smiles happen long after all of us are gone. On a summer’s day when the ranch is in its full glory, one can’t help but smile. Paso foals prance happily alongside their mothers in deep green fields shaded by towering cottonwoods. The flow of the river and birds atwitter echo the blessings of a good year. Passing under the old Rancho La Villita sign that spans the main drive, it’s not hard to imagine the sight and sound of the stagecoach rumbling in to deliver weary passengers or a letter from afar, as they did 275 years ago. And while much of the 18th-century history of Rancho La Villita has been lost to time, the scene is timeless. Windom, too, appears timeless astride a Paso festooned with the elaborate handmade tack of Peruvian tradition: wooden stirrups, tooled leather saddles, sterling silver buttons and bits. She wears a white jacket, pants, and a Peruvian hat while on the Western show circuit and at the annual national show. And though she doesn’t compete there, she often travels to the national championships in Peru, where, she happily reports, Paso breeding is again going strong. When not competing or traveling for an international art fix, Windom is home on the Rancho La Villita range, where she currently keeps a herd of 35 Pasos and is anxiously awaiting the birth of 12 baby Pasos next year. To date, she has sold 50 to 60 Pasos throughout the United States, where fewer than 10,000 Pasos live today. Others have gone to Belgium, Holland, and Germany. La Estancia Alegre is now a sophisticated enterprise, but Windom’s original desire for a strong, sure-footed trail horse remains the same. Windom’s “Why not?” attitude—her brio, if you will—flows through the many new projects continually under way at the ranch. At the Rocky Mountain Horse Expo in 2011, she met Mark Bolender, the three-time national grand champion and guide in Extreme Mountain Trail riding, a new discipline for horses and riders alike. Bolender offered to come to Rancho La Villita to build Windom a course to teach riders how to handle a horse, and to test the mettle of horses, through a challenging trail course. The ranch now hosts Extreme Mountain Trail clinics led by Bolender each year (see “Need to Know,” p. 50). In the end, as the name says, the story of La Estancia Alegre is a happy one. Even as Windom and di Suvero craft a new historical narrative for Rancho La Villita, they remain committed to maintaining its rural history and essence. They frequently welcome professional photographers and their students to capture the experience of a ranch at the cultural crossroads of New Mexico and Peru. Windom’s daughter has opened a charming cottage B&B for discerning travelers. And while the couple does not offer riding or hire out their horses, they happily accommodate those who wish to stroll from the barn along the Río Grande and the beautiful bosque woodlands.